The transformation ability of the Paranormal Slime is the primary one, along with Topaz Attunement (possibly two, one for each row) on an artifact to let them get in the hit to activate it - if they don't go first, then you'll still just a vanilla punk for when they hit and kill you. I like Eternal Rest on another to prevent shenanigans, and the other three I run general buffs on; Abnegation, Fanaticism, and A Little Piece of Hell, because Splash is always worthwhile. The other main one I can think of is the Raven Ritualist's Gravestorm, paired with effects that delay and endure attacks. It used to be Thunderstruck Phoenixi all the way, but I honestly never played that build and can't advise well on it. Doom Devils with Timebomb are a third option, because the effect is an instant kill regardless of stats, if an unreliable one IMO. Are there certain abilities that are a must have for deep/infinite builds? It's all relative. Once you make an infinite depth build you can get your creatures to whatever level you want with comparatively little effort. A six ParaSlime team with maxed Feral Brilliance catapults your entire Stables into the thousands easily. Calamity is indeed an excellent include in most setups. Note however that it, along with most other stat-based setups, falls of a cliff eventually(Except if you use para slime). A general rule of thumb is to start looking for other sources of damage other than stats around realm 150+. A Nether Demon Brim Smith is cool and all, but the additional attack you will gain from your artifact later in the game is actually rather low. My rather fresh full-attacked Resin Sword has a total of around 80k attack, however this is still just about 8% of my lvl 7400 Omnipotent Diety. The calamities look absurd once you get up higher in attack, but eventually things have millions of hp so it barely scratches the surface. Put calamity on the nether brim.. that will take the place of splash.. also get your monsters situated before you finish all the quests.. the quests will go alot quicker the faster you kill things..
Calamity is unbelievably good. 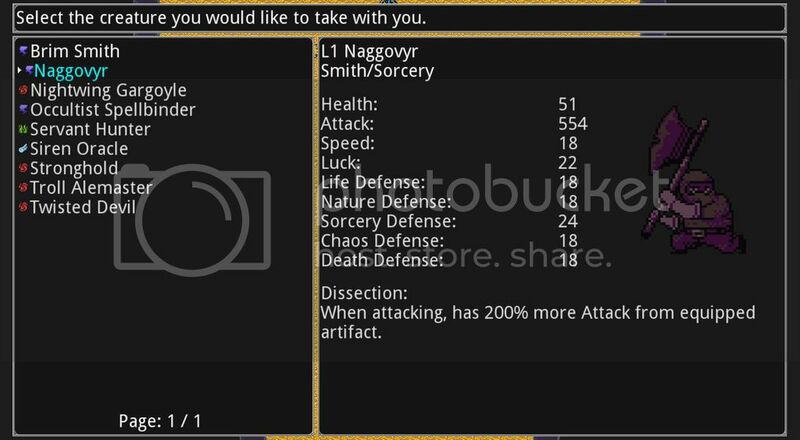 The description doesn't make this entirely clear, and I didn't bother using it until I started facing Omnipotent Deities, the creature that has Calamity, and kept getting brutally wiped. Currently I haven't even enchanted any artifacts yet. I've been trying to unlock all the creature tiers (completed 19 tiers so far) first to see what I want my party to be and which legendary mats I want. Upon using the brim in battle(when he doesn't get 1-shot the first turn, being low lv and all), I've noticed that Cinder Devil's ability(A Little Piece of Hell) doesn't proc when it auto-kills a creature with the Crimson Day ability. I would look into replacing the Cinder Devil in the future, I basically have him so both my brims clear the enemy team quickly. Always good to have something to finish off nether enemies with. Though I think I'm not quite as far along as you, so you might have a better idea about that. How many tries did it take you to get the dust to take? I've burned the two I've found so far, with no effect. What do you guys think, should I re-roll the ability? I'm kind of leaning towards yes, because as of current I have a Cinder Devil in my party, and with all that splash damage and boosted attack I doubt I'll be attacking something less than 40% hp without it dying straight away anyhow. Page created in 0.179 seconds with 56 queries.